Nov. 15 Dave, Ben, Jojo, Terry, Chris and I meet for beers, elk burgers, and talk of biweekly gatherings of winter bowmaking. Hunting seasons are over, we’re all freed up and wanting to keep the hunting connection alive. The timberframe solarium where we meet is filled with elk and deer racks, drying tendons and hooves, tools, and handmade bows in various states of completion. Now it takes on a new dimension, how I always hoped it would as the sun arcs lower, throwing daytime heat deep into the space: the wintertime cave where the people gather to craft their tools. At night the heat leaves slowly, replaced by the energy of friends joined in easy laughter and united efforts. Nov. 27 Sunday after Thanksgiving: Jojo, Chris, Terry, and I drive through a couple inches of new snow to cut bow-quality juniper off lower Hermosa Road. USFS pole permit on the dashboard. Chris totes his chainsaw and we have a couple folding Silkie Saws. We cut seven sweet, straight poles (at least ten to twelve staves out of the bunch), and labor them all back to the truck. Sloppy wet as the snow melts, sweating, and satisfied. Terry and I scavenge the scraggly tops off a couple for Charlie Brown-style Christmas trees. Nov. 30 Off work early and back home with Jojo, eager to evaluate the juniper trunks. With trademark Filipino alacrity, he chooses a section, debarks, Skil-saws, then splits out a fine clear stave in minutes flat. Later in the evening, he hatchets down on the purple heartwood and cream sapwood as Terry debarks the upper segment from the same pole. Chris comes over boozed up from a political bet gone wrong. Dave and Ben absent with truck troubles and family obligations. Nonetheless a full solarium of chopping, scraping, and rasping productivity through the dark cold night. Chris is making progress on his 2007 black locust stave (“it’s not a 2×4 anymore”). He takes a deep breath and sits back admiring the dark yellow wood. That heavy sighing sound he makes in a moment of relaxation brings me back two months ago when he and I labored over his freshly killed bull elk high in the Weminuche Wilderness. The meat was in game bags, clean and cooling in the spruce shade. We sat back with satisfied grins, the whole story of his success still new in our minds like the bull’s tracks crisp in the mud of the spring nearby. That deep breath again and the ‘schlick-schlick’ as he sharpens his knife before removing the tendons from the lower legs for later use in backing bows. Dec. 14 Full attendance tonight. I sit back and watch the friends unite. Ben giving Chris encouragement on his handle-shaping. Jojo talking fresh powder skiing while coarse sawdust flies off his stave like spindrift snow. Dave piddles away on his old maple stave’s handle with a dull rasp, and Ben opts to carve a bow for his son. 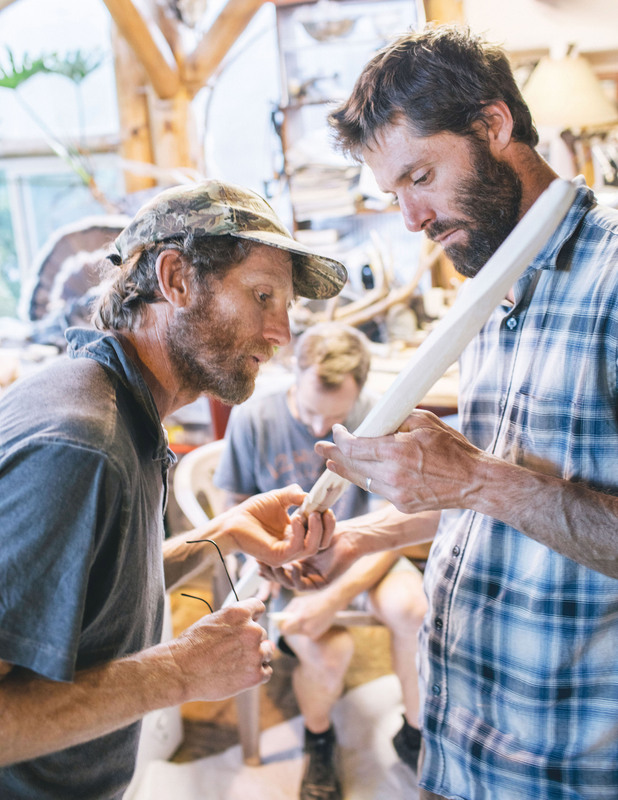 “Someday you have to bend the wood,” shoots Ben’s words in Dave’s direction. “Where’s all your finished bows-I-mean-firewood now?” slices back Dave. Ben stays late again, helping to stack up an impressive number of empty beer cans and leaving with a fistful of elk tendons and a box of juniper-shaving firestarter. Dec. 28 A rousing post-Christmas bowguild. The six inches of new snow gives town a festive touch, while the mountains to the northwest are glazed by several fresh feet. Trudging through the backyard with staves and toolbags and stomping snow on the weathered wood floor, the craftsmen arrive. Ben musing on the sinew we apply with hide glue to strengthen the backs of bows: “What are the tricks? Are there any short cuts? How picky do I have to be in selecting and sorting of the fibers once I actually manage to free them from the tough-as-nails tendon I started with?” Ben answers himself (several hours later): “No short cuts. Few tricks. Very picky.” Jojo makes up for lost time, whacking down heartily on his stave, as does the thoughtful and consistent Terry. Dave sits on the plastic lawn chair throne and tells stories, making raspings of white maple. I give out presents of my homemade San Juan Buck Soap (made with mule deer tallow), unscented and a bit gamey; an experiment in using more of the whole animal. Jan. 11 The business of laying out tarps, setting up folding handy-bench and chairs; work stations and lighting established. Pleasantries and updates. I introduce the idea that next meeting will be first annual Vintage Cassette Tape Night. Jojo progresses through many pin knots and gets his stave bending. Terry’s patient detail work is evident on his clean stave. Chris sits n’ spits, and evens up the limbs on the black locust. I jump around with whatever advice I can lend, then rasp and sand on the bow I’ll use for hunting this fall: sinew-backed yew, a meshing of the finest wood from the Pacific Northwest with elk tendon power from the La Plata Mountains. This bow has it all: a gentle reflex-deflex shape, dense in the handle but light at the tips, hardly a flaw to its symmetrical bend. Smooth and deadly. Jan. 25 Hard, cold night after big snows last week. Twelve to eighteen inches blanketing Southwest Colorado. Three of us huddling in the lamp-warmed solarium drinking cans of stout beer, rasping bow wood, listening to vintage Rolling Stones on a scratchy cassette. Lots of elbowroom without the usual five to six guys. Dave says he’s got a “snow situation” at his house up in the mountains, nowhere left to throw the snow from his tunnel-like walkways. “Man, I still can’t believe we all got one this year,” muses Dave, “Heather’s been loving cooking that elk.” Terry and I nod knowingly, feeling the luck, the gratitude, and our bodies running on that pure wild meat. “Some Girls” by Mick & Company, a small pile of course saw dust, fine chisel scurls, the squeak of the tiller board pulley. A quarter hour before our time slot ends we yawn, shrug the mantra: “The bow’s still in there,” and satisfied, shake out the tarps, give hugs, flip off the lights, crunch out into the cold, back home…On my way upstairs to bed, I imagine the wild game somewhere not far, opening the evening feed belly-deep in snow on a nearby slope, nibbling tips off shrubs or hoofing down to some remembered tuft of grass. Hunting season seems a long way off. March 22 Dave cranks up the Cavaliers vs. Nuggets basketball game on the radio and gets busy heat-bending his maple with the heat gun and piñon sap varnish. Jojo shows up with a bow he made several years ago and starts tillering to reduce the draw weight. I’m working on a new yew bow for my daughter Rose, as her unbacked juniper exploded when she last drew it. We all inspect the carnage of splintered wood and try to assess why it failed. Terry and Ben work on separating elk tendons into sinew bundles for backing their juniper staves. The shop fills with the singed smell of pine sap and the easy laughter of buddies. April 5 Bow Guild starts with sun still up at 6:30 a.m., then alpenglow flares and fades quickly on the west facing ridges. The greenhouse section of the solarium workshop is taken over by tomato and winter squash seedlings. Rose’s bow still needs reduction to drop into comfortable kid’s draw weight. Dave shows up after the Ska Brewery Mexican Logger release party, passing out the tasty local lager to all. After scraping off the piñon sap crud from his heat-treated maple, we all admire the symmetrical limbs and how the now dark amber wood rings dense like some tropical hardwood. I’m a bit bleary after the last few full days running the hills searching for shed elk antlers. Finding an antler that was so recently attached to those awesome beasts seems like such a prize, almost enough to sustain me until September hunting season arrives again. And it’s getting me in wicked shape again. May 3 The last Bow Guild on the calendar. With spring progressing, the gang’s been busy with new work projects and family outings, while I’ve been high in the forest canyons again, following the elk, visiting the places the bulls have been. Daylight still permeates the early evening solarium, and the seedlings in the greenhouse are growing head-high on the bar, lush and fragrant. There are few fully finished bows from this winter and spring’s enterprises, but the Guild has been a total success. And the best news: The meetings have been so much fun, such a needed social outlet in our busy lives, we decide to continue indefinitely. Because…the bow’s still in there. Tiller: The process of evaluating the bending of a bow’s limbs.